While the phrase “rice cakes” may conjure up images of plastic wrapped puffed-rice pucks, restaurant-made rice cakes have more in common with crab cakes in terms of their moist consistency. Using this technique gives your rice an interesting shape on the plate, a nice browned color, and a delightfully crunchy crust. 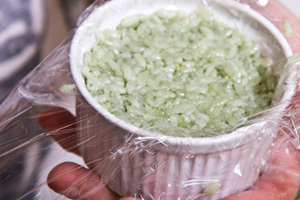 These beautiful green rice cakes were made using bamboo rice. 1. Make rice according to the pilaf method, and immediately spread it out onto a sheet pan to cool. Spread it as thinly as possible. If you’re in a hurry, you can put the tray in your fridge. Just be sure to put it on the top shelf or cover it carefully with plastic for sanitation purposes. 2. Once it has been cooled, use a ring mold, round cookie cutter, or ramekin lined with plastic wrap to form the rice into cakes or disks. ¾ of an inch thickness is ideal. 3. Lightly dredge the top and the bottom of each cake in all purpose flour, and carefully lay them in a hot oiled frying pan. 4. Cook until the down side is crispy, then carefully flip the cake and brown the other side. Serve with your favorite seafood (such as Pacific halibut) or game bird. For more robust rice cakes that will pair well with game meats, veal, or kobe beef, use risotto (perhaps flavored with wild mushrooms) instead of pilaf. good technique…thanks for sharing it. These sound way tastier than dry store bought rice cakes! They do sound like more of a fall or winter side dish, though, so I will have to try to remember this in a couple months. I bet you could mix some yummy stuff in with the rice when you spread it out, too.